The Embraer E-170 aircraft flight simulator built by FlightSafety International for Russia’s second biggest carrier S7 Airlines, has received EASA accreditation, the manufacturer has announced. This European Aviation Safety Agency qualification specifically includes the association’s latest ‘Issue 2 training device upset prevention and recovery’ capability. 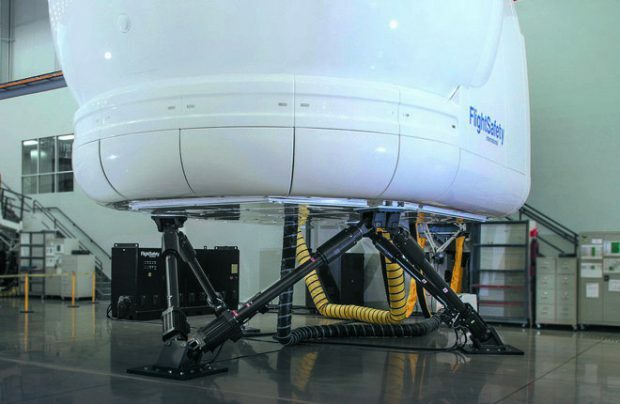 “The upset prevention and recovery training capability incorporated into this new advanced technology simulator further increases the value of the simulator and will help to enhance safety,” explains Scott Goodwin, vice-president of simulation at FlightSafety. The delivery of 17 Embraer 170 regional jets to S7 Airlines was completed in June as part of the airline’s regional development strategy. “With the new full flight simulator, designed by our trusted partner FlightSafety International, our captains and first officers are [now] able to take initial and recurrent training at S7 Training, the largest aviation training facility in eastern Europe. Its advanced visualisation system enables our experienced instructors to recreate all possible flight conditions and teach the necessary skills,” reveals Vladimir Obyedkov, chief executive of S7 Airlines. The new FlightSafety FS1000 simulator is located at the S7 Training facility at Domodedovo Airport, Moscow, and its advanced technology capabilities enhance performance, increase availability, and reduce the life-cycle costs compared with previous-generation devices, FlightSafety insists. These benefits include electric motion control and cueing, and a new multi-function Instructor Operating Station that features an intuitive interface, scalable graphics and large multi-touch displays. S7 Airlines is Russia’s second largest carrier, with a fleet of 91 aircraft. In its winter schedule the airline operates flights to some 181 destinations in 26 countries throughout Russia, Europe, the Middle East and Asia, and with an extensive network in the Commonwealth of Independent States. S7 Airlines is a member of the oneworld global aviation alliance and has a wide internal route network founded on the basis of hubs at Moscow (Domodedovo) and Novosibirsk (Tolmachevo). To date, FlightSafety has delivered more than 140 flight-training simulators for commercial aircraft. They cover a variety of devices for a broad range of aircraft types manufactured by Airbus, Boeing, Bombardier and Embraer.